We are heartbroken that our son Jaden has passed away on Oct. 28th in Children's hospital at Stanford. He was in our arms when he left to a peaceful place where he will find abundance of happiness. He was also surrounded by a group of caring physicians and nurses. About 2 weeks ago, Jaden got sick and became acidotic. After checking in the ICU, a central line was placed as Jaden is always a tough draw. Within 2 days his acidosis was quickly controlled. But then he had persistent fever and he developed sepsis. Despite excellent medical effort, Jaden's condition worsened. We were with him every minute in the last few days and he left us peacefully. 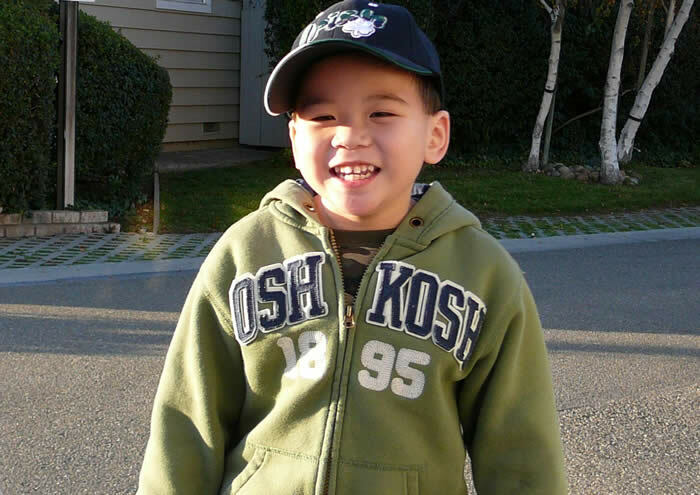 Jaden's memorable life is full of stories, fighting spirit and moments of happiness. Jaden had a severe early crisis after birth. He recovered miraculously after 7 days of comma, after aggressive life saving medical treatment. He was doing well for a couple of months until his feeding and ammonia level were off and a g-tube was required. At 7th month he had infantile spasms, one of the worst type of seizures for a child. Fortunately his seizures were resolved after half year treatment of Vigabatrin. Jaden learned to walk at 18 months, a big surprise to his physician and staffs. However Jaden's cognitive development was severely delayed. Jaden loves sound, likes to play with toys with buttons to push to make sound. Jaden is an explorer who likes to check out every room and every corner in the house. We apologize for not updating this community for a while until now. We've been extremely busy. We've been blessed with two girls after Jaden: Joelle is 2 and 9 months and Elena is 1 year old. They have done prenatal testing and both are healthy and beautiful girls. Jaden receives excellent medical care from Lucille Packard Children's Hospital at Stanford. His regular blood test shows optimal biochemical management. Jaden is well loved by our family, the care givers, physicians, therapists, teachers, social workers and everyone who knows him. He is a special adorable boy that everyone has a special place for him. Jaden's life has touched many people, including more than one hundred of physicians and nurses who cared for him. He taught us nothing is difficult, nothing is impossible. He also taught us happiness can be in many different forms, but the one experienced by special need child is the purest. We wish the best to the families here. We know having a special needs child is a challenging but rewarding experience. We are so thankful to the advice and help we received from families of the Organic Acidemia Association.